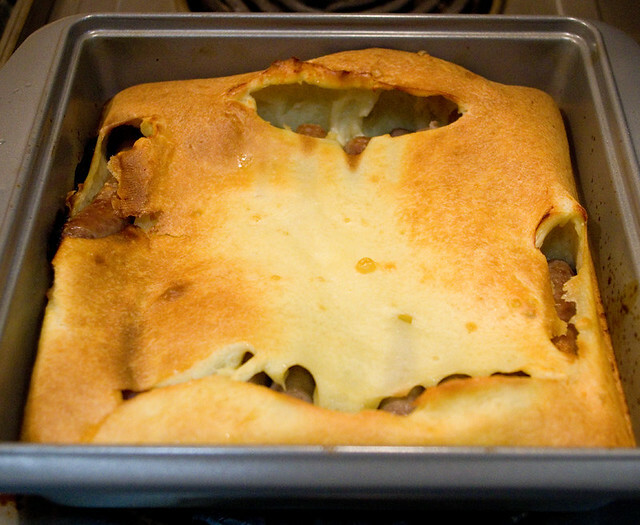 I’ve been wanting to try to make toad in the hole for ages. I have vague memories of my Nan serving it, or at least something similar, although I couldn’t remember the name… I Googled “pigs in a blanket” and “bubble and squeak” before I finally figured out what the name was of the dish that I remembered. 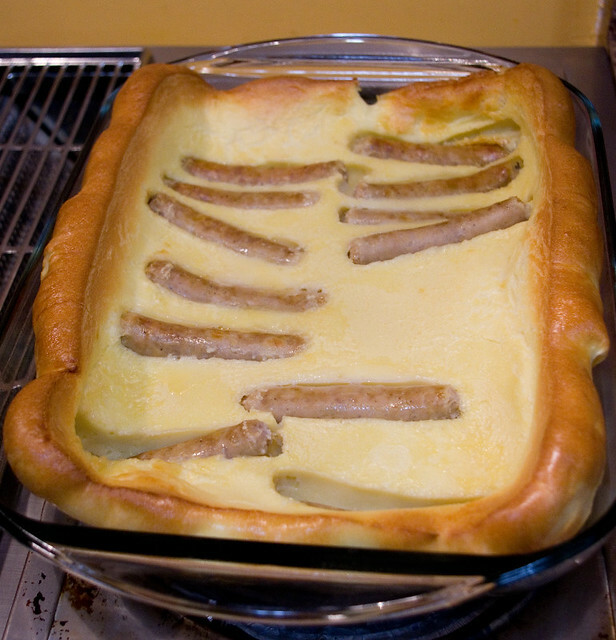 Basically, toad in the hole is sausages baked in Yorkshire pudding batter — with regional and temporal variations, of course. Although the photos I’ve found online use thick sausages for the most part, I distinctly remember the version from my childhood containing smaller breakfast sausages, so that’s what I was determined to make. The first time I tried it, I wasn’t very happy with the results. I used the Yorkshire pudding recipe from the Joy of Cooking (page 637, 2006 edition, Rombauer & Becker), which was recommended by my father. I doubled the recipe and doubled the size of the pan, which I thought would work just fine, but the sausages were just too small to compensate for all that batter. Also, although the edges of the casserole rose and puffed up quite nicely, it didn’t cook evenly through the center, leaving it a stodgy mess. I mean, the texture was firm enough to be edible, but it wasn’t very appetizing. I tried to learn from my mistakes the second time around. This time I whipped up only a single batch of the batter, which greatly improved the ratio of batter to meat, at least for sausages this small. 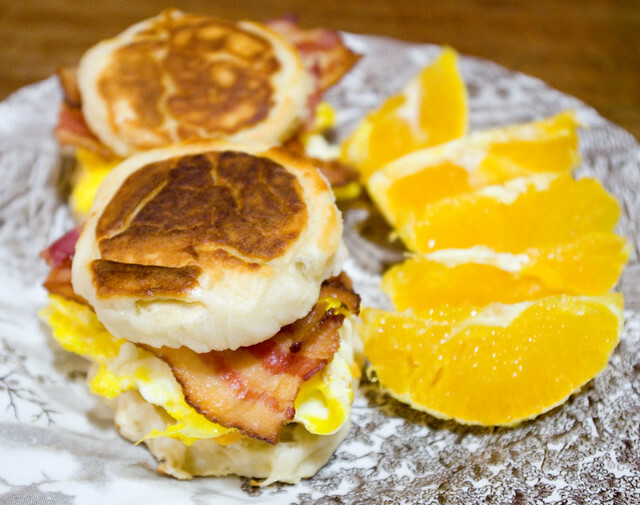 I cooked it all in a pan that was half the size, which allowed it to rise more thoroughly. 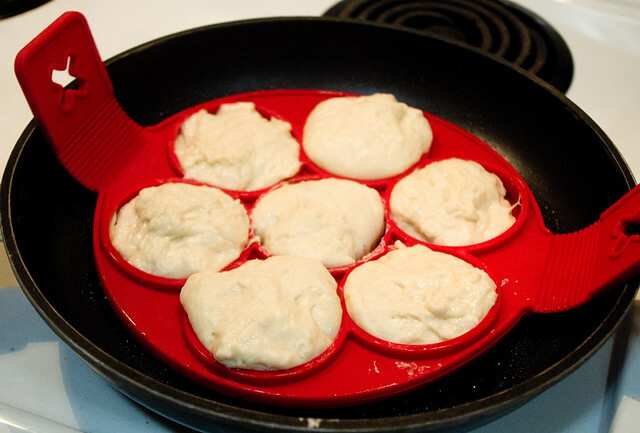 Also, I used a metal pan instead of a glass one, which I find in general allows for a crispier edge to baked dishes. I was really happy with how it turned out. The pudding rose beautifully, so fluffy in the middle that in many spots it was completely hollow. The crust was nice and crisp without being hard. The sausages were perfectly done. Now, if only I’d remembered to grease the pan, since to serve it I almost had to destroy it. You’d think I’d know better by now. 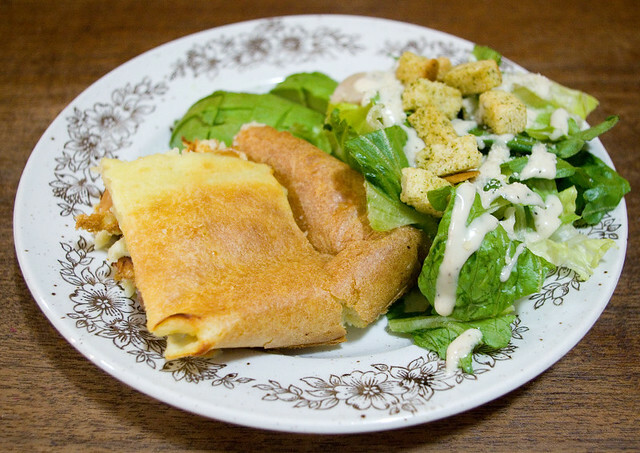 I served my toad in the hole with a side Ceasar salad and some sliced avocado, which my Nan would never have done (she’d have paired it with boiled or baked veggies). But I thought we needed some fresh greens with a main dish that doesn’t contain a single vegetable. The family ate it all up and asked me to make it again soon, which tells me that it was a success.